"Stephanie, you're heading for Georgia!" Near the crest of the ridge Dr Fonda turns right, following the Appalachian Trail, instead of left onto the blue-blazed Loudoun Heights Trail. Oops! "Want to try something really audacious?" 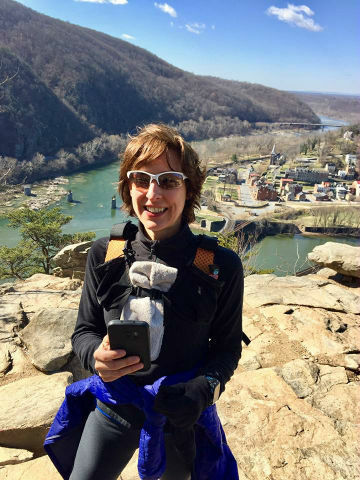 After Tuesday's double trek up Maryland Heights Stephanie has ~24 miles scheduled for Saturday. "Maybe we could do Loudoun Heights AND Maryland Heights — twice? No, that's just too crazy!" So at 0815 this morning we find ourselves running across the bridge over the Shenandoah River. "Next time we do this, we really need to bring more water!" somebody remarks, six hours later. 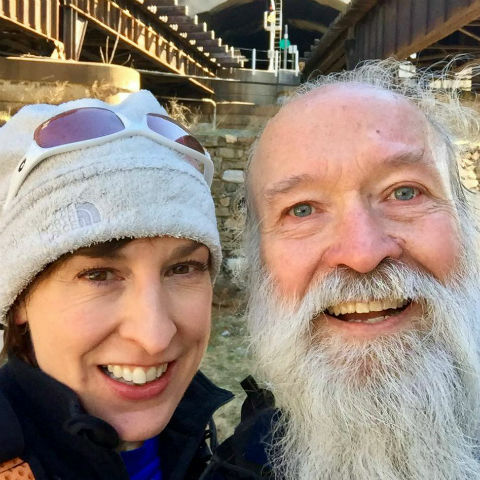 We're both dehydrated after finishing one Loudoun Heights ascent, returning to take the Appalachian Trail across WV, and then running up Maryland Heights twice — with a bonus digression to visit the overlook above the Potomac. Now we're heading back into Virginia to tackle Loudoun Heights once again. Wow! "Wait a minute. You said 'next time'. So ... that means we're going to do this again!" Dr Fonda traps me once more. Hmmmmmm! Brisk: temps rising from the mid-20s to the upper 30s, winds gusting 20-30 mi/hr. 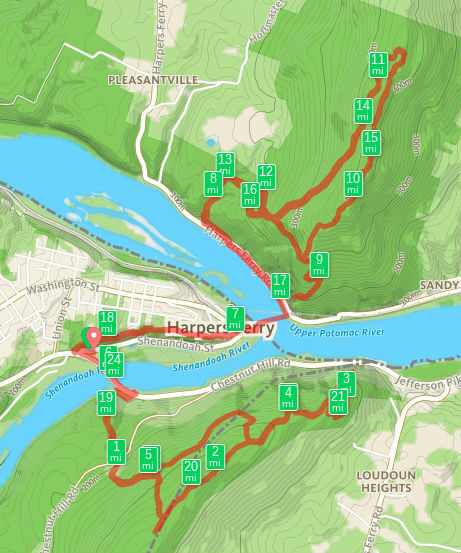 Flashback: 2010-10-23 - Quad State Quad Buster — lost in the woods on Loudoun Heights after crossing Maryland on the Appalachian Trail, scary, alone in the dark. Happy: Paul & Paul & Jeff give us fist-bumps when we unexpectedly meet on Maryland Heights. Delightful: singing along to the classic rock song "Centerfold" during the dawn drive up to run. Stressful: after mile 19 ancient legs cramp and pace slows. Compromise: send Stephanie ahead to the overlook, meet her as she returns. Her day has at least half a mile of extra awesomeness. 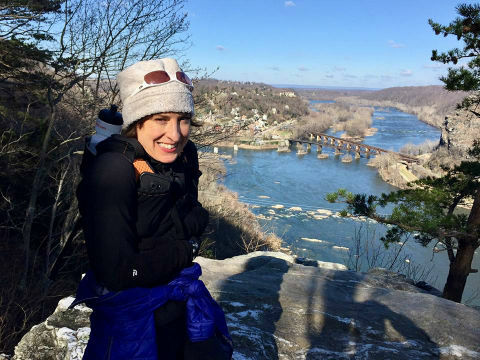 Run of Legend for Stephanie and her Wood Elf: more than 6,000 feet total ascent, says GPS. Next time: add Weverton Cliffs! ?